Just a short note here to recap my experience on riding a motorcycle for the first time in my life. I’ve always wanted to learn how to ride one but never quite found the chance to do it till now. Most of the time, it was my mom swaying me from buying a motorcycle due to a high accident rate. I understand that and I realize that motorcycles can’t quite hold my golf bag either. So when I moved to here in Korea, I was car-less for the first time in my life since I got my driver’s license at age 16 and I was trying to acculturate to the society’s ways—lots of pedestrian walking and use of subways. Except there’s one problem: Seoul has ten million people living in the area, making it one of the most dense cities in the world. There would be times that subways get so full that I have to forgo and wait for the next one and it would be even full too. So, my own claustrophobia was starting to act up and I thought of something—some kind of medicine or remedy to that. The answer lies in the motorcycle. I made up my mind that I would look for a bike and luckily found one in the marketplace on a very good deal. The seller was a foreigner who was moving back to Europe for graduate school, hence the sale of his bike. It was in Daegu, so I took the train down there and met the guy there. Did the deal and I rode off. I have experiences driving cars with a shift, so I have a basic understanding of how shifting/gears work but never the actual maneuvers of it, so at first, I was jerky with the motorcycle, not quite getting the gears right or putting on the right amount of gas from my right hand. Gravity plays an important role for pushing the bike into motion and gas only adds to the velocity. The rest is all up to you to bring ability to ride the bike. I’ve been snowboarding for 7 years, so I find both of them to be similar in respect to motion, balance, and gravity. It didn’t really take me long for the bike and I to become intimate and feel as one on the road. Accelerating, decelerating, shifting, braking, passing, and cutting corners to put it into one nice motion. I’m hooked and Korea has many mountains and I’ve seen some nice spots where it would be good to relax and swim in the water. 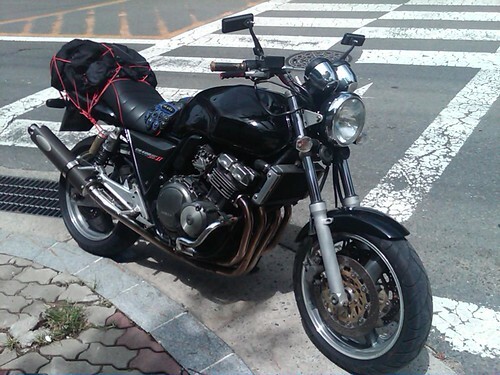 I plan to ride around a ton and getting know Korea in a rather intimate way. Car accident attorneys focus on helping those who have been catastrophically injured in motor vehicle (cars, motorcycles, scooters, trucks and buses) crashes throughout the State of California but not accepting cases when there is little or no injury or when there is only property damage. If you’ve been injured in an auto accident, a personal injury attorney can help you deal with car insurance companies and ensure that you receive fair treatment in settlement negotiations. For more information about the process, click here.